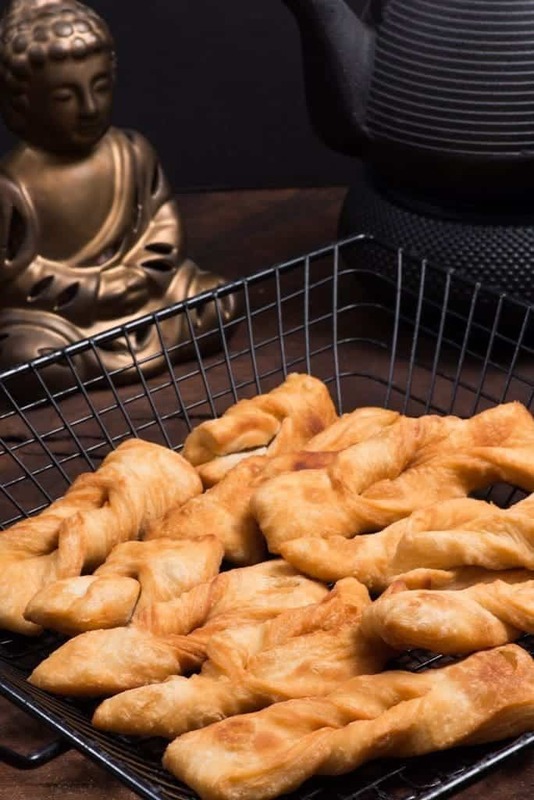 Mongolian butter cookies called boortsog are really scrumptious treats, they are really more like fried dough than cookies. We enjoyed them straight from the fryer dipped in our Mongolian tea to end our meal. The leftovers were actually really good with tea the next day but you may not have any leftovers, they are that good hot! They can be served with honey, butter or even cheese. Another quick and easy recipe, thanks Mongolia! In a bowl, mix together the flour, water mixture, and butter and knead extensively to a tough, dense dough, add flour or water as necessary. Let rest for about 30 minutes and knead again to remove any air bubbles. Cut a slit in the middle and pull one end through making sort of a knot shape. Heat up you oil in a frying pan and deep fry until golden brown on each side. Remove and serve warm with Mongolian tea.